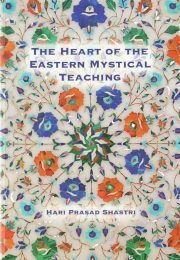 The Heart of the Eastern Mystical Teaching is a presentation of the traditional non-dual (advaita) teachings. It takes the form of an account of the life of an enlightened Mahatma, known as Shri Dada, from Aligarh in Northern India, who lived from 1854-1910. The non-dual teachings on the identity of the individual Self with the Supreme Self are given in their purest form, together with examples of the qualities that need to be developed on the path to direct experience of Reality. Shri Dada was the disciple of a traditional Guru, who nominated Shri Dada in turn as a teacher to continue the line. He never became a renunciate and lived an outwardly normal life among the people, whose hardships he shared. As well as the teachings themselves, we find an record of the example Shri Dada gave in all his words and deeds, and the effect this had on those around him. The teachings and deeds of Shri Dada are recounted in this book by a close follower, whose presence is nonetheless invisible. In this sense also, the book exemplifies the traditional non-dual etiquette. Although a Brahmin by birth, Shri Dada was among the first to reject the caste system, and he counted so-called ‘untouchables’ among his closest friends and devotees. Equally, he made no distinctions according to gender, and gave teachings and initiations to women. He also recognised the same truth at the heart of all the great religions, insisting that Jews, Christian, Muslims and Hindus were all worshipping the same Truth in their different ways. He readily met and communed with sincere people of all faiths. This outlook attracted the hostility of some sectarians and orthodox, but Shri Dada’s lack of narrow selfishness and absorption in the being of God and his Guru, made him a true expression of the spirit of the Bhagavad Gita and the Upanishads, and he became known as ‘The Saint Universal’. There is much in the Heart of the Eastern Mystical Teaching which relates to the particular time and place in which which the events it describes occurred. But its substance is an expression of the pure, traditional non-dual teachings. To read this book reflectively and imbibe its spirit will help us to deepen our meditations and inner inquiries. If we are receptive, it will nurture an attitude to the teachings and the teachers which will allow us to benefit most from contact with them.